As if our attention spans weren’t short enough already pre-smart phones, now event professionals have to contend with a whole technologized universe of distractions – including social media apps, gaming apps, wearable technology, media walls, etc. – on top of fighting off good-old-fashioned boredom and daydreaming. Getting and keeping the attention of our guests has been and always will be one our biggest challenges as event professionals, and our jobs have not gotten any easier in the 21st Century. But instead of swimming against the current, some event pros have found ways to use technology to their benefit in enhancing attendee engagement, while others have turned to tried-and-true methods and even some unconventional tactics. So here are several event engagement strategies that some seasoned event pros are using regularly to improve attendee engagement at their events. Instead of creating a disjointed environment of separate spaces – which silos your attendees and hence your event – consider designing a floor plan where you have one large event space divided up into concentric areas using wall panel systems. For one of their clients, Event Strategy Group designed a layout that split one large space into four separate layers, starting from the perimeter and moving inward. Aamodt said that interaction at the event was “at an all-time high,” and it’s easy to understand why … because everyone was in the same proximity and there was a logical, intuitive flow for attendees. She has employed assigned seating for other events like meetings and professional networking events and has seen engagement skyrocket simply because she is forcing people out of their comfort zone and to interact with new people. At these business-oriented events, “people are more often than not just wanting to get through the presentation, check emails and get back to the office,” says Massey. So by assigning attendees to seats and/or tables where they don’t know anyone and providing them with icebreaker activities, you have created an environment that encourages engagement from the outset, which sets the tone for engagement throughout the rest of the event. Yes, this may be old-school, but it still works because it acclimates your attendees to interact with each other from the outset. Assigned seating is one way to prime the pump regarding event attendee engagement, and providing guests with some form of entertainment first also sets the stage for increased participation and creates a lighter, more collegial mood. The first step in improving attendee engagement is getting organized and laying the foundation for a great event. And Planning Pod gives you more than 2 dozen online event management and venue management tools to make that happen … try them today for FREE. Since most people will be looking at their phones throughout the event regardless of what content you put in front of them, you might as well use that behavior to your benefit. And Rachel Rosenthal actually provides corporate meeting attendees with rented iPads for presenting content. Not only does it turn the focus away from their own devices, but the loaner iPads “allow the attendee to be engaged further through the use of surveys and participation during the session with questions. Attendees are almost always interested in seeing something new at an event – in some cases that’s the reason they are actually attending in the first place. So you can either showcase the latest trends and ideas in the industry, or you can use new technology to wow them and enhance the event’s environment. Making a wall or structure come alive by superimposing a moving, morphing image on top of it certainly stimulates conversation and adds another dynamic element to your events. As guests and attendees, we have been trained to look at a stage or focal point to take in the main content of events. But what if content and interaction came at us from different angles, engaging us in surprising ways? There’s something to be said for making your event environment comfortable for guests and attendees. COOK Medical Group has created such a welcoming meeting environment by outfitting their meeting space with lounge chairs and sofa-style seating (in white leather, no less). “These large seats accommodate attendees by offering comfort and a less stratified form of seating. No rows of folding chairs,” says John Eckberg of COOK. And it is making a difference, making guests feel more relaxed and tuned into each other and the event activities. Sometimes in the scramble to secure the perfect venue and create exotic menus, things get lost in the mix, and often one of those things is “content.” This is why many events end up with industry experts as keynotes and content providers … because it’s almost a no-brainer. On the other hand, professional speakers have spent many years honing their craft to grab an audience’s attention, inform them in unique ways and inspiring them to go out and take action on their new understandings. Plus they also have tons of experience custom-tailoring content for a wide variety of audiences. So if you want content that will make your attendees put their smartphones down and engage, consider hiring a professional to create and deliver your content and keynotes. You can also go a step further and hire a professional MC as well as script out your shows and main content sessions to ensure continuity and avoid those dull spots in your content. 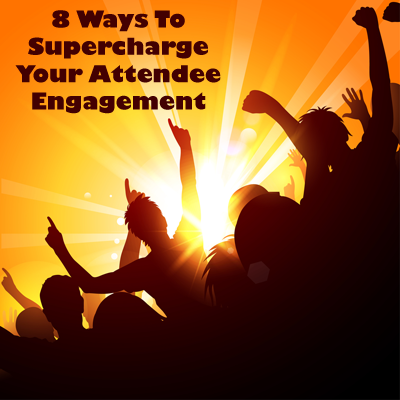 Have more ideas on how to improve attendee engagement at events? Provide them in the comments below.